Want to diversify your portfolio by investing in the three asset classes of Equity, Debt and Gold? Already have a diverfied porfolio, but wondering how to rebalance it? Have too many investments across all these asset classes and are looking to consolidate? The Quantum Multi Asset Fund (QMAF) is the answer to all the above questions. QMAF is a Fund of Funds scheme which will invest in various Quantum Mutual Fund Schemes. These schemes of Quantum Mutual Fund will fall in to different asset classes of Equity, Debt and Gold. So, as an investor, you get a professional Fund Manager to take care of the diversification needs of your portfolio and have the ease of looking at the performance of one fund in one statement, rather than looking at multiple statements and trying to rebalance the portfolio yourself. 1. Diversifies across asset classes to reduce risk and optimize gains. 2. Offers investors exposure to various assets in a single investment. 3. Rebalances the portfolio at regular intervals based on the performance of underlying assets, relieving the investor from monitoring asset markets. 4. Quantum Mutual Fund has strong research capabilities across various asset markets - equities, debt and gold. 5. Has among the lowest expense ratios in its category. Solution For: Invest in Equity, Debt and Gold in one fund. Ideal for investors with low and medium risk appetite and looking for a balanced portfolio for their investment. The Scheme is co-managed by Mr. Chirag Mehta and Mr. Nilesh Shetty. Mr. Chirag Mehta and Mr. Nilesh Shetty are the Fund Managers effective from July 11, 2012. Past performance may or may not be sustained in the future. Load is not taken into consideration and Returns are for Growth Option. What is Quantum Multi Asset Fund or QMAF? A multi-asset class investment would contain more than one asset class, thus creating a group or portfolio of assets. Multi-asset class investments increase the diversification of an overall portfolio by distributing investments throughout several asset classes. This reduces risk (volatility) compared to holding one class of asset. Quantum Multi Asset Fund - QMAF is an open ended Fund of Funds scheme which will invest in various Quantum Mutual Fund Schemes. These schemes of Quantum Mutual Fund will fall in to different asset classes of Equity, Debt and Gold. • QMAF invests in equities, fixed income and gold based on research backed investment process. • The asset allocation is based on time to time performance of the underlying asset classes. • QMAF constantly monitors assets and performs constructive rebalancing of the portfolio according to the changing market conditions. • QMAF offers freedom from monitoring different asset class instruments and helps to reduce your hassles by investing in one single scheme. • QMAF is an extension of traditional balanced fund with more diversification. • QMAF aims to reduce risk of losing portfolio value and generate modest capital appreciation. What is the Investment Objective of the Quantum Multi Asset Fund? The investment objective of the Scheme is to generate modest capital appreciation while trying to reduce risk (by diversifying risks across asset classes) from a combined portfolio of equity, debt / money markets and Gold schemes of Quantum Mutual Fund. The Scheme may invest in the units of debt / money market schemes of other mutual funds to gain exposure to debt as an asset class to manage any investment and regulatory constraints that arise / that prevent the Scheme from increasing investments in the schemes of Quantum Mutual Fund. There can be no assurance that the investment objective of the Scheme will be realized. What are the different features available under the Quantum Multi Asset Fund? Where will Quantum Multi Asset Fund invest? What is the Current portfolio? Portfolio allocation between the units of equity, debt/ money markets and gold schemes broadly depends on the relative valuations between the asset classes. Relative valuations are determined by evaluation of various influencing factors. 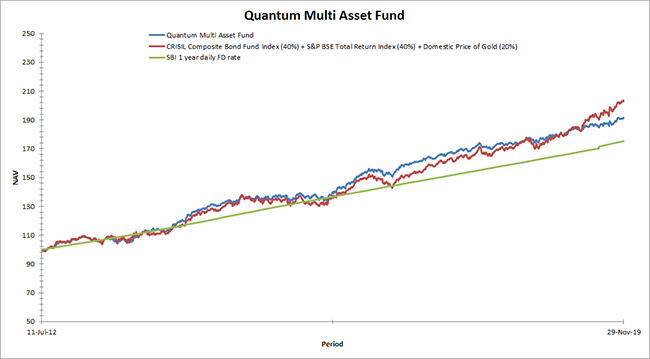 Click here to view the current portfolio of the Quantum Multi Asset Fund. What is the Benchmark of the Quantum Multi Asset Fund & Why? The Scheme’s performance will be benchmarked against Crisil Composite Bond Fund Index (40%) + S&P BSE Sensex Total Return Index (40%) + Domestic price of Gold (20%). The Benchmark has been selected as the Scheme being Fund of Funds scheme predominantly investing in the units of Equity, Debt / Money Markets and Gold schemes of Quantum Mutual fund. Therefore, the aforesaid benchmark is most suited for comparing performance of the Scheme. Who is managing the Quantum Multi Asset Fund? Mr. Nilesh Shetty is the associate fund manager of the scheme. Nilesh has more than 12 years of experience in research. He has been a part of Quantum Asset Management Company since 2009, and at present is the Associate Fund Manager for Quantum Long Term Equity Fund and Quantum Multi Asset Fund. Nilesh is a qualified CFA (Chartered Financial Analyst), and has completed his Masters in Management Studies (Finance) from the Mumbai University. What is the minimum amount I need to invest or redeem in the Quantum Multi Asset Fund? Please refer below table for the minimum amount required to invest or redeem in the Quantum Multi Asset Fund. How do I invest in the Quantum Multi Asset Fund? What is the current expense ratio of the Quantum Multi Asset Fund? The expense ratio of the Direct Plan of the Quantum Multi Asset Fund is 0.26% p.a. with effect from July 1, 2017 (Post GST). What are the entry and exit loads for the Quantum Multi Asset Fund, why does it impose an exit load? a) 1.00% if redeemed or switch out on or before 90 days from the date of allotment of units. b) NIL if redeemed or switch out after 90 days from the date of allotment of units. The scheme is intended for investors with a long term investment horizon. The exit load is imposed to discourage investors who may buy and sell frequently which will adversely impact the returns of the other investors. Investors who have stayed invested for at least 90 days will not be charged any exit load. The exit load in case of SIP & STP will be calculated on FIFO (First in First out) basis. What are the different options/facilities available under the Quantum Multi Asset Fund? Can I hold the units of the Quantum Multi Asset Fund in Demat mode? How has the Quantum Multi Asset Fund performed? To check the performance of the Quantum Multi Asset Fund you will have to go through the current factsheets. Tell me more about the NAV applicability and cut-off timing of the Quantum Multi Asset Fund. To know more about the NAV/price applicability and related concepts please click here. Tell me about the Tax implications if I invest in the Quantum Multi Asset Fund. Taxation of Mutual Funds in India can be divided in two parts Capital Gains & Dividends. To know more on the Tax implications please click here.